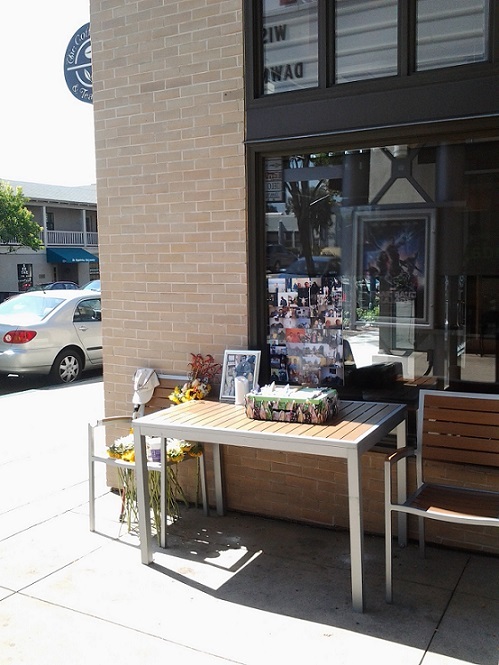 A tribute at Claremont’s Coffee Bean and Tea Leaf to a regular who died leads off my Friday column. 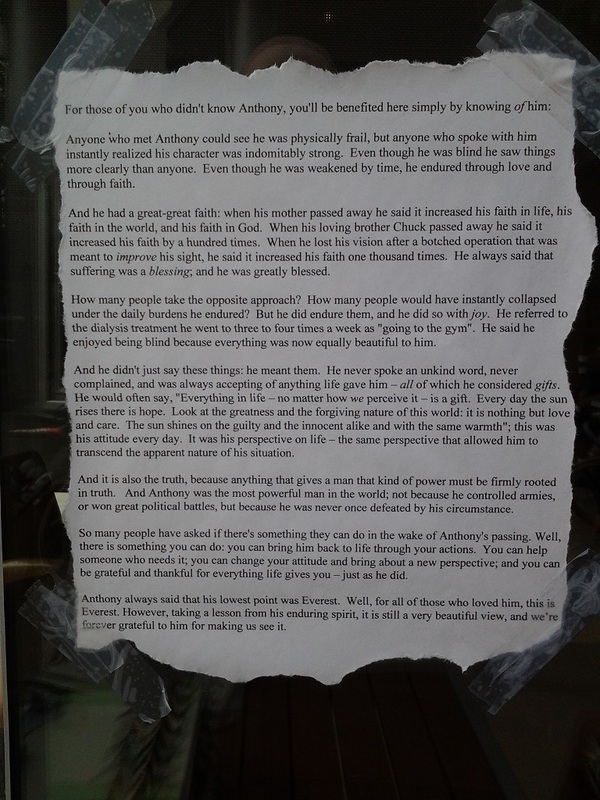 There’s a photo with the column of Anthony Raya at the coffee house. 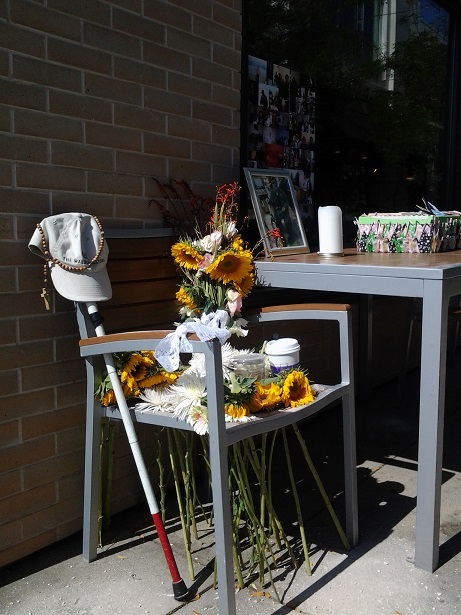 If you’re a regular in that area, you’ll say, “Oh, that guy!” And here are two photos from Wednesday morning of the scene so you get a sense of the memorial and Raya’s regular spot. I happened on this by accident. On a whim, I got breakfast at Jamba Juice that morning before going into work and sat down at one of the outdoor tables. I spotted the memorial across the walkway, walked over and realized who it was for. As a frequent customer at Coffee Bean, I could fill in some of the rest. An employee and the manager came out to check on the table and I got Raya’s name and details from them. Wish I’d known about the memorial tribute that took place the night before, but I felt like I’d lucked out by seeing the memorial table and by knowing some of the story already. This is one of those small moments in the life of a community. They happen all the time; the general public (and us as journalists) rarely know about them and the people involved don’t think “this is news,” but once in a while, we find one and can make something from it. * Update: I saw this addition on Friday. Click on the photo for a more readable view. It’s not in a barn, unfortunately — how cool would that be? — but rather in an older, oak-shaded strip center. 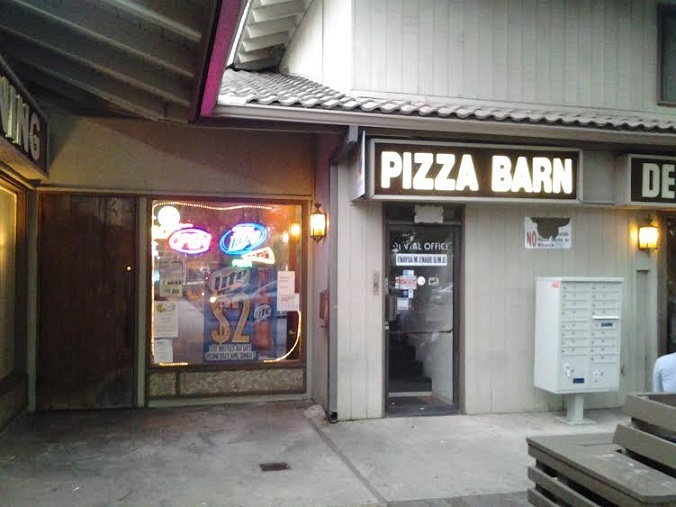 I’ve seen Pizza Barn for years, especially as a regular at Taste of Asia in the same building, and remember a positive New Diner review of the place, but I had never stepped inside until one recent Monday evening. There is only one window and the door is wood, so you don’t really know what you’re stepping into. Well, it is kind of barn-like inside: The ceiling is exposed and peaked. It’s also kind of bar-like: There’s a bar, a small one, with maybe nine beers on tap, and posters for Miller and Coors. They also have small tables and one long table for communal dining or large groups. You order at the counter. I got a small sausage and mushroom pizza ($10) and a Coke from a very personable employee and took a seat. The Home Run Derby contest was on the TV. 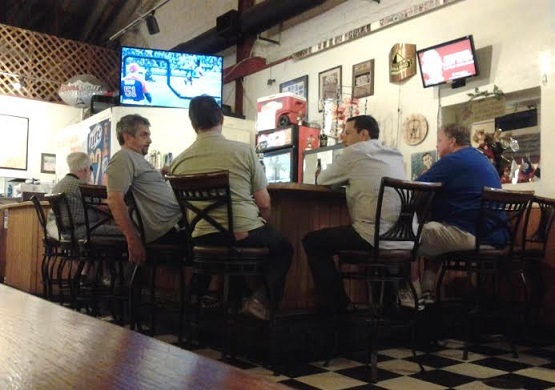 A few guys were seated at the bar, a small group at the big table and a few other patrons scattered around, and a couple of people came in for to-go orders. For that night, at least, it was basically a middle-aged crowd. 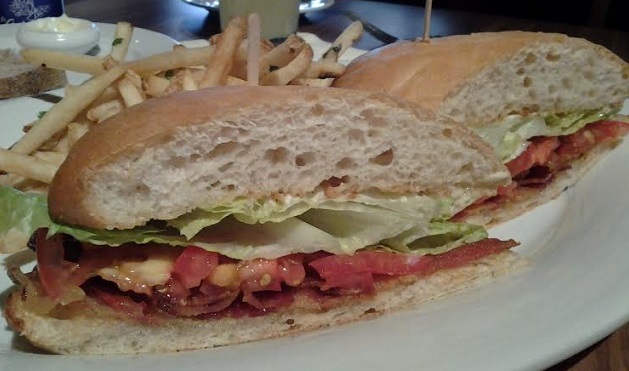 Besides pizza, the menu has calzones and stromboli, hot and cold sandwiches (including one called Mario’s Ultimate, which sounds like a Dagwood, a little of everything), a few pastas and salads, burgers, wings, and fish and chips. (Yes, fish and chips.) They serve all you can eat spaghetti on Wednesdays for $4 and tacos (yes, tacos) on Tuesdays and Thursdays. My pizza had generous toppings, lots of cheese and a thick and crispy crust. The slices were dense and chewy. 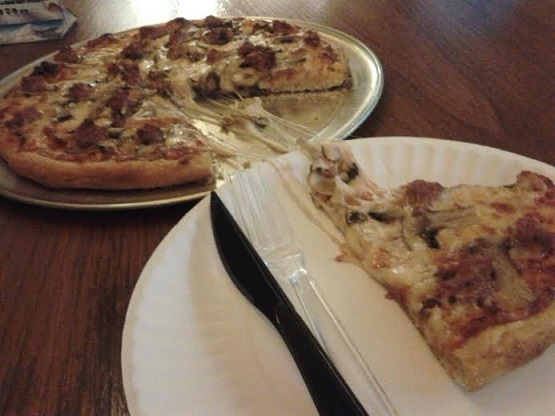 I ate half and took the other half home; when ordering, I’d thought about getting a 12-inch medium to ensure I had leftovers, but that didn’t prove to be an issue even with a 10-inch small. It was what I would call a good bar pizza. The decor is as eclectic as the menu. I saw sports trophies, a shelf of kerosene lamps, a couple of random framed pieces of art, a Lotto machine, video games, paneling and ceiling fans. Pizza Barn probably hasn’t been remodeled since it opened in 1992, nor should it be. It’s got character. This looks like a scene from UCLA this week, but it’s actually La Verne. 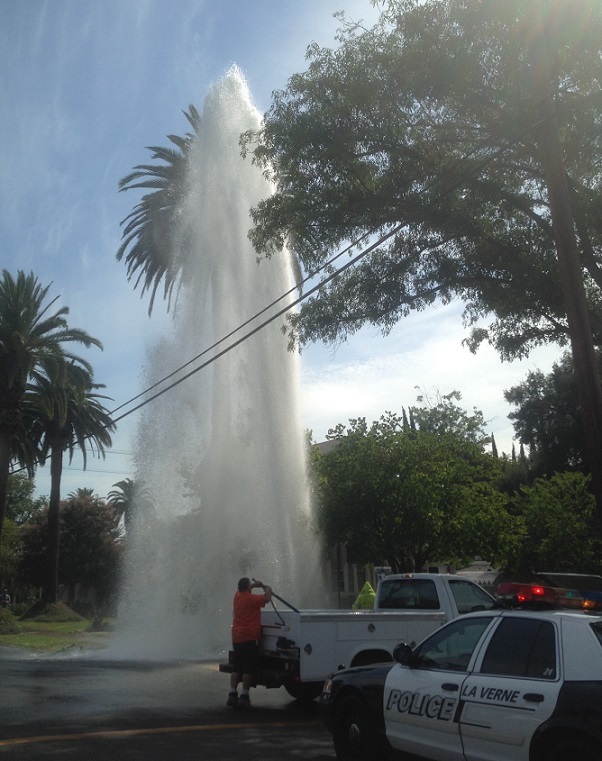 Reader Nathan Keeler shot this at 3:50 p.m. Wednesday at D and Sixth streets, across from Roynon Elementary, where a car struck a hydrant and broke it. The water was jetting up 40 feet high, Nathan says. A little spot news on my blog. Nathan, by the way, is 16 and a resident of Claremont. Thank you, Nathan! Nice picture. 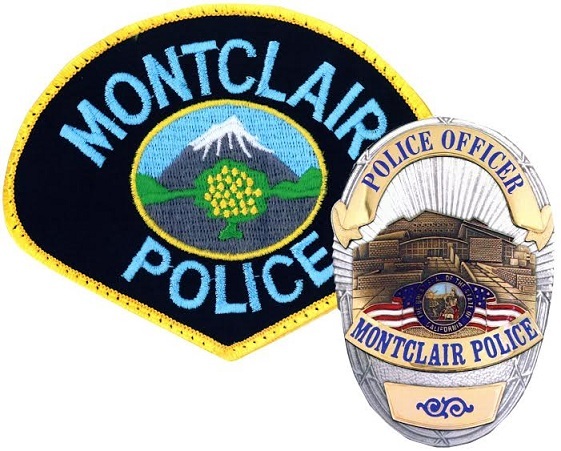 Wednesday’s column begins with an item on the architecture of the Montclair Police Department, then presents some shorter items. Above is the station, below is an image of the police badge, which incorporates the building’s likeness, and the patch. 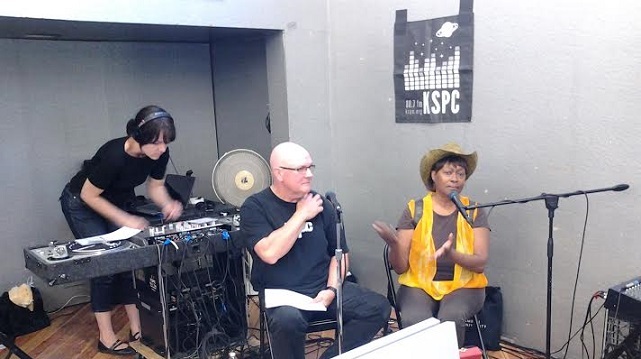 Claudia Lennear, right, talks about her musical experiences Saturday with KSPC-FM’s DJ Ike Rhythm (as station general manager Erica Tyron handles the sound duties). This took place on the stage at Claremont’s Rhino Records. Were you there? A few dozen of us were, and the talk was fascinating. Lennear, you’ll recall, was a ’60s and ’70s backup singer who was featured in the documentary “20 Feet From Stardom,” and she lives in Pomona. I shot two short videos. In one, she talks about her 1973 solo song “Not at All,” about Mick Jagger, and in the other, she performs the song “Gee Whiz” a cappella. Donut Man in Glendora (915 E. Rt 66) is renowned for its fresh strawberry donuts, generally available February to July. 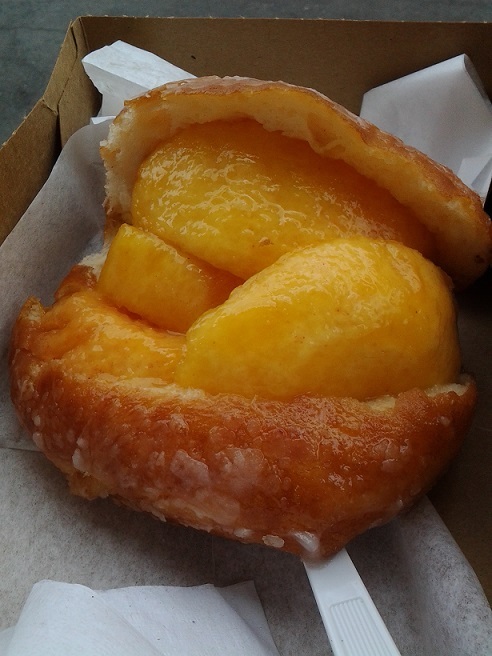 It’s less well-known for its other fresh fruit donut, the peach, in part because the peach season is so much shorter, often only one month. Last year I missed out completely. On Sunday I got one, bought directly from Donut Man Jim Nakano himself, who was manning one of the order windows. Check out this bad boy. At $4, it’s the most expensive donut I’ve ever bought, but it’s well worth the dough (ha ha). And yes, that’s a fork partly visible in the photo. Personally I like the peach better than the strawberry. I think the taste pairs better with the donut shell. The fact that it’s rarer no doubt adds to the allure. 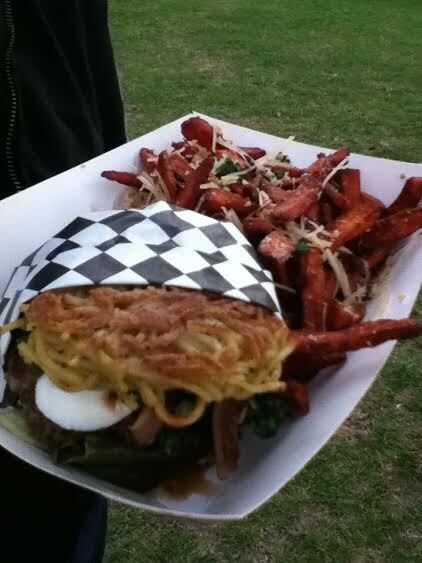 Ramen Burger is opening its first brick-and-mortar location in Los Angeles’ Koreatown, but the L.A. Times also reports that it’s coming to the Fair in Pomona, which takes place Aug. 29 to Sept. 28. I haven’t had one, but I’m glad to hear I can stick close to home and get one soon. * Also, the Fair’s Chicken Charlie stands will debut deep-fried Doritos and deep-fried chicken skin, according to LA Weekly. Sunday’s column begins with a reader email about the days of yore concerning Ontario’s old Sunkist factory. After that, items, some of a particularly eye-opening nature (if I do say so myself). Friday’s column is a paean to the 1989 Beastie Boys album that came out 25 years ago today. There’s even a local angle: the Dust Brothers, who co-produced, met at the Claremont radio station in 1985. You might say this column has been in the works for years. 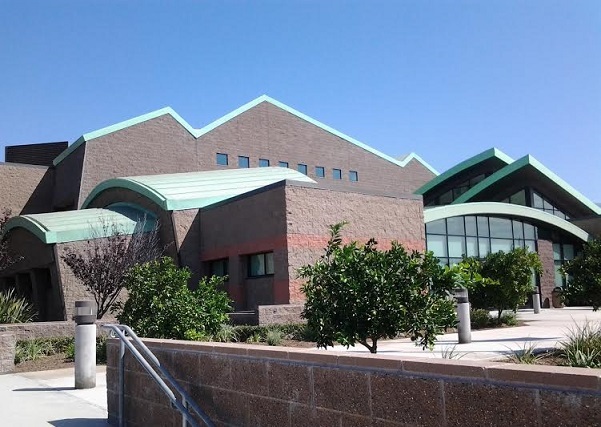 I learned about the duo’s Claremont connection back in 1998 or so when researching notable people who attended school in the Inland Valley. A year ago, I read the “33 1/3” book on “Paul’s Boutique,” which goes into great detail on its making and tells about the KSPC connection. But that was around the time of the album’s 24th anniversary. (In hip-hop terms, the timing was ill.) So I took notes on a paper napkin (!) of page numbers for easy reference, put the napkin in the book and made a note on my calendar for 2014, learning delightedly that the anniversary coincided with a column day. And here I am with a column. See, I only make it look easy. Co-owned by the same guy behind P.F. 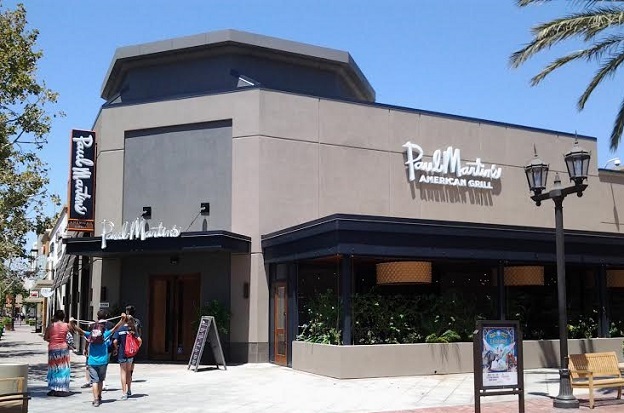 Chang’s and Fleming’s, both also at Victoria Gardens, Paul Martin’s opened in June in the former Paisano’s/Sisley space by the AMC theaters. After two failed Italian restaurants, that spot has gone upscale American. 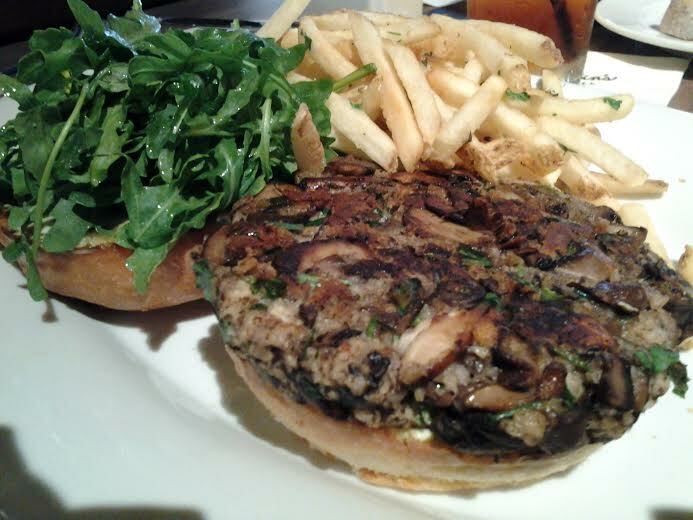 I tried it out for lunch recently with a friend who was a repeat customer at the Irvine location. 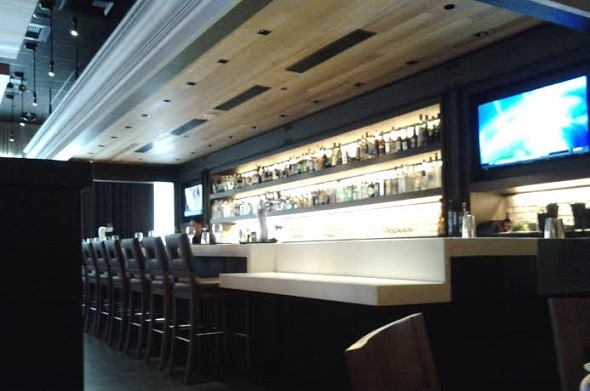 The interior is swank, with low lighting, lots of wood, a full bar (photo at bottom) and a large wine rack. What they serve here is American classics, but done up in a modern ways, made from scratch, with seasonal and artisanal ingredients. 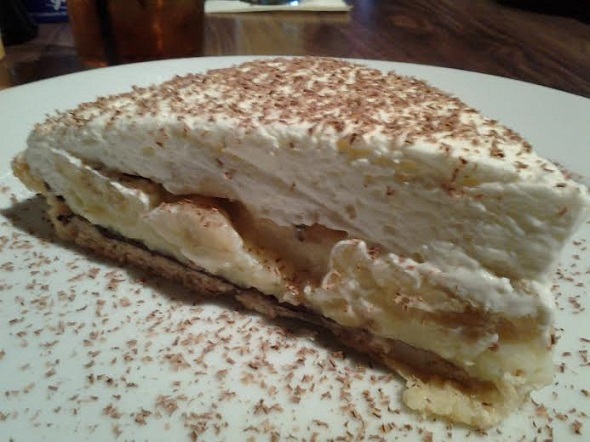 I got a slice of banana cream pie for dessert, if only to see what a $10 slice of pie looks and tastes like. It was sweet and rich, and too much for one person; I’d have been better off taking half of it home. Cocktails are $11 and are said to be great. There’s an extensive wine selection and some micro-ales. Of the other entrees my friend has tried, the brick chicken is especially recommended. The menu has salads, soups, burgers and sandwiches, seafood, chicken and steak; it’s tightly focused, with just a few examples of each. Dinner entrees range from $9 to $40. The lunch menu has three $12 items. And there are intriguing specials, like a three-course fried chicken dinner on Tuesdays for $22. I would certainly return. Paul Martin’s is a good addition to Victoria Gardens and one of the finest restaurants in the city. Also, check out the restrooms. They’re austere, stylish and dimly lighted, like an art installation. How often can you say that?